Site is being built by hang glider history enthusiasts. This domain started on September 22, 2010, by a WHGA committee. The pre-Rogallo hang gliders that "look" like they might have come post-Rogallo revolution have been anachronistically noted by some contemporary users as "Rogallo" hang gliders out of respect for the cause of the sensitivity to form and function that arrived in the commenting persons, which cause was a rooting of experience from the Rogallo Wing Revolution. No harm is done regarding the pre-Rogallo era in seeing the French, etc. knowing and using flexible wing hang gliders. Comment can thus be bifurcated for some instances of mechanical occurrence where two things rise in comment, one from the awareness of the post-Rogallo wing revolution, and one from a respect of the actual historical time of mechanical showing. Look to Whitehead and Beeson for stark Rogallo anachronisms! Look to the hang gliders of Berck-sur-Mer for Rogallo anachronisms! And find--in at least 1908--in a hang glider the most simple control arrangement: cable-stayed triangle control frame or A-frame! That A-frame was used morphed into almost all later powered aircraft as an undercarriage landing device with wheels and skids, perhaps the most ubiquitous frame part of aviation! We certainly do not let narrow self-serving orgs like FAI to constrain what is a hang glider; FAI has fallen into disrepute for its very low scrutiny of facts over hang gliding history matters. The rich history of hang gliding shows a flow over several centuries, a sport flow into three centuries, a commercial flow into three centuries; in the middle third of the second of the three centuries came a Rogallo Revolution in which enthusiasm played to spark an exponential growth in participation in hang gliding; the Rogallo influence played a giant part in the grand play. All I know is that from as far back as I can remember I've wanted to fly. Probably my first experience of actual flight, apart from in my mind, was as a small boy holding out my coat on the sea wall into a very strong wind and jumping to the shingle below. In Stephan's book he has a photo of someone doing much the same with a blanket from a hill side. Nature shows that a simple stretched membrane between the limbs can become a glider as in the flying squirrel. The water ski kites serve the same function mechanically. Early "birdmen" used their limbs in freefall with a stretched membrane before resorting to the parachute for landing. The backs of my school exercise books were full of all manner of flying devices. S ome were built as models with varying degrees of success. A double skin ram inflated wing was tried which, as far as I know, predated any other such devices. The thrill of taking to the air is still strong in me and passing this on to others is reward enough without the need for FAI recognition. The 1940s and 1950s Rogallo wing hang gliders from the hands of Francis Rogallo and Gertrude S. Rogallo. A story of 1955 in Indonesia. Water ski-kite (boat tow), indeterminate if there was Rogallo influence or not. The direct Francis Rogallo kites and gliders that he made and demonstrated to inform the NASA and NASA-extended community in the late 1950s and the early 1960s; these kites and hang gliders and Francis' direct communications and showings rooted a revolution that would not stop growth and influence. John Worth "wrote the book on Rogallo Wing"
Jim Hobson in 1962. On TV. The Hobson one-person hang glider was a Rogallo hang glider. Editor of EAA's esteemed magazine Sport Aviation easily wrote without apology: "Rogallo Wing Hang Glider"
Woods and Blazek in 1962 had Rogallo hang gliders. Barish Glide Wing was actually a Rogallo hang glider (canopy paraglider hang glider), as Barish's developments were influenced by the fully-flexible base Rogallo wing canopy; he widened and segmented the Rogallo wing canopy; his improvements and refinements were novel. David Barish. Moyes' kites were also used as Rogallo hang gliders. Bennett's kites were used also as Rogallo hang gliders. Koman-Faust Rogallo hang glider. Dial-Soap hang glider. Kilbourne's Kilbo-Kite was a Rogallo hang glider. The plans were forwarded to 23 nations by Self-Soar Association in its Low & Slow publishing flow; this spawned a huge manufacturing flowering throughout the world following the big mover-and shaker Otto Meet on May 23, 1971, picked up by National Geographic, Los Angeles Times, and more. Rogallo hang gliders have payload masses hung from a gliding wing that had been significantly influenced by the flowering leadership of Francis M. Rogallo. "Rogallo hang glider" is a meta descriptor under which one finds builders adding their own local meaningful names. Rogallo hang glider builders and users might find themselves calling their Rogallo hang gliders a NASA paraglider, a Prentice string triangle control hang glider, a Palmer glider, a Burns Ski-Plane kite-glider, a Miller glider, a Bat Glider, a Batso, an Omega glider, an Eipper-Formance glider, a Bennett delta wing glider, a ski-kite Dickenson kite-glider, a sport Standard Rogallo, a Paresev paraglider, a paraglider, a Rog, a "rod," etc. The leadership of Francis Rogallo that radiated throughout the world was rooted in patents, speeches, conferences, white papers, talks, memos, projects, investments, discussions, loaned NASA reports, photographs, reports, models, flight demonstrations, and more. Publishers, people, hobbyists, designers, builders, users, etc. extended that body of leadership to far corners of the world, much of which is very traceable in the literature. One may wonder just what time-and-place arrangements let one man's influence be so emphatic. For answers, one looks to the flow of large historical factors: NACA, NASA, Russian Sputnik, space race, reentry solution drive, war, freedom, kiting, desire to fly like the birds, model aircraft flowering, serendipity of places ... combined with material access, dreams to revisit strongly earlier hang gliding solutions, and more. Smaller historical factors came to play also; a kite hobbyist Rogallo who was an aeronautical engineer Stanford-University-trained-restricted-from-regular-aircraft-flying-by-health-reasons communicator, tinkerer-builders like Palmer and Prentice, dreaming-building Soaring Magazine editor Richard Miller, an itchy aqua-kite showmen coordinating with NASA-Rogallo info streams in the hands of airman Mike Burns of Australia, jumping-flying Olympian kitist, Dacron, aluminum tubing, bamboo, gifts from the past like the 1908 Breslau cable-stayed triangle control frame (TCF) that remains true-to-form over 100 years after a gliding club's use in a hang glider, etc..--all these matters and timed flows of action gave foundation for writers, publishers, designers, sportsmen, and hobbyists to give homage to Francis M. Rogallo with the use of the terms Rogallo wing, Rogallo hang glider, Rogallo ski-kite, Rogallo aqua-glider, Rogallo hang glider, Rogallo paraglider, Rogallos, etc. All such was an overlay on history that has blossoms flying today. In the 1940s aeronautical engineer Francis M. Rogallo was working professionally and at home on wing matters. He invented a purely flexible wing that when stiffened revisited early kites and gliders of the 1800s and first decades of 1900s; but because of his time and place and his actions of leadership in the midst of times of space-race needs, the fully flexible and stiffened Rogallo wing received millions of dollars of research attention and the care-to-tinker hours of thousands of people around the world at nearly a dozen levels of glider genre: art, models, model powered craft, principle demonstrators, governable parachutes, space-craft-depolyables, man-carrying hang glider Paresev project kite gliders, parawing toys, parawing parachutes, towed kite-gliders, towed ski-kite pontooned aqua gliders, towed ski-kite gliders, 1960 string-controlled framed Prentice hang glider, 1961c Palmer's seven or eight modifications (including in-front-of-pilot-triangle control frame), powered payload-delivering Rogallo-wing gliders, and much more for military and peaceful uses. Tinkerers later would come up with quick builds and feel that old-time important and exciting invention feeling while their actions had roots in the NASA-flowered radiance of information and image that had Francis Rogallo drawn into the exciting soup and swirl of building, flying, and discussing. Thus a popular revolution, one then magazine:\ gave a title: "Rogallo Revolution" placed Rogallo and NASA-spread images and reports into the hands of experts and hobbyist sportsmen throughout the world. The enthusiasm of users of those decades would even find themselves anachronistically calling 1904 Frenchmen Jan Lavezzari's flexible-wing hang glider a "Rogallo hang glider" in homage to their experience with what flowed from the Rogallo Revolution; such anachronistic play need not detract from the exploratory findings of the turn-of-the-century French; both flows may joyfully dance in the history of gliders with hung masses. And that many from 1908 through 1950s would uncover the utility of the 1908 cable-stayed triangle control frame (TCF) for manned hang glider use is just another happy part of the full Rogallo hang glider story. The use of the TCF was evident in almost all aircraft in one modification or another, mostly relegated to the important use of an undercarriage for taking off and landing; however Pilcher, Beeson,, Breslau pilot, Santos-Dumont, Spratt, Benson, and others made special pointed use of the TCF. Then others would later follow the known arts. Francis Rogallo was positively many things, but he was not a comprehensivist as regards hang glider invention historicity; and in his own enthusiasm one finds misappropriation of "invention" declarations. Clearly the French 1904 Berck Beach use of a Jan Lavezzari stiffened flexible-wing hang glider meant that at least by 1904 flexible-wing gliders were understood by those skilled in the arts of wings and gliders; indeed, one finds flexible wing gliders made and used in the first decade of 1800s and before by such as Cayley and Walker. Frederick William Brearey of 1880 is to examined and credited also. And the Beeson patent of 1887 clearly records use of weight-shift control of the pendulumed-massed pilot on a stiffened flexible-wing kite-glider. The full story of Rogallo more resides in a fortuitous combination of many circumstances combined with his own leadership actions. All are invited to help tell the story of Rogallo hang gliders. Send your notes, images, etc. to Notes@RogalloHangGliders.com to help grow this reflection. Inspired by the long service of WindSports and SeedWings and Mike Burns. Trike using Breslau 1908 TCF with high-aspect ratio batten-rib DS flying wing evolved from Paresev Rogallo wing: "Short field landing"
It is certain that many people from many countries made contributions to the development of the flexible wing hang glider. In the aviation context of 'first flights' and recreational vs. commercial developments, it must be noted that new and old inventions often complement in synergy; it is in this evolutionary and social context that the crucial developments put together by Sir George Cayley, Percy Pilcher, Otto Lilienthal, Octave Chanute, William Beeson, Francis Rogallo, Igor Bensen, Richard Miller, Barry Palmer, Volmer Jensen, Mike Burns, John Dickenson, Bill Bennett, Bill Moyes, Bill Moyes, Joe Faust, Irv Culver, Dave Kilbourne, Roy Haggard, and others were the ones that were most successful and influential on the evolution of hang gliding. See: http://www.flightglobal.com/pdfarchive/view/1961/1961%20-%200723.html Flight 1 June 1961. On May 23, 1961 (Otto Lilienthal's birthday) ... the article notes the maiden flight of the shown hang glider piloted by Lou Everett. See Flight's March, 1961 issue for some coverage of the Flex-Wing. When power is off: the craft: hang glider. and their flex-wing glider in 1962. Call for full history. Anyone? Thanks for any help on this one. Then they were also aiming at adding power. Full story should be interesting. They built and flew their kite-hang-glider. for sale. So, did they do the plans? Did they sell any? Are the two guys still living? In 2008, the matter was discussed some in hang gliding history circles without photos and details. Now some photos appear on the table in the Sport Aviation magazine of 1962. Tag: JD, GH, template, Rogallo wing hang glider. JoeF, December 24, 2012, note posted elsewhere. Template was already extant; waiting was not needed. weigh the templates in patents prior to 1963.
a fence that had already be crossed and flown. Gossamer Odyssey: The Triumph of Human-Powered Flight By Morton Grosse At the served page of the link, see the choices for Rogallo pages; some may not show, as the full book is not present. Paul MacCready, sailplane soaring luminary [[MacCready Speed-to-Fly Ring calculator for soaring]] had a first hang glider flight in a Rogallo-Palmer-Miller Bamboo Butterfly in 1969. At the Lilienthal meet in Newport Beach, CA on May 23, 1971, the author writes that Paul was towed up in Taras Kiceniuk's Batso hang glider [[a Rogallo hang glider]]. The author did not note that the cord used for that towing was brought to the meet by Joe Faust to supply such actions as needed. Two years after the Otto meet, a 3/4 sized version of the Batso was made on which two other sons of Dr. Paul MacCready learned to fly. Aerotowing Rogallo Hang Gliders. Pilot-Induced Oscillation & Lockout Index. It has been shown that there were zero secrets in Dickenson's or McBroom's kite gliders; so, nothing to steal; all was in public domain as regards mechanical invention. John Worth had it all and simply--and before___Craigo,___ Effinger,___ Girard, ___Armstrong, Henry Struck, others of the moment, and Palmer, Richards, Purcell, Hobson, Burns, or late-comer JD. Indeed, even in 1908 it was accomplished: battened flex wing with A-frame control and pilot hung from keel for foot-launching hang gliding, not even needing a tow. And Whitehead illustrated for us all the mechanics involved in a patent in the first decade of 1900s; and he was expressing arts already in the common pool. No mechanical invention for JD on Mark I or any further version. But his significance in the Bills' play for merit of the Bills' eventual follow-through firms a good story of one of over 12 important flows that came together to form a renaissance that started in at least 1960. And children who forget to point to parents might have cause for shame; a child declares "I am the beginning and end of all things." seems to ring of a god complex. ARP did not claim invention. The only one in the room claiming mechanical invention is the GH-JD party complex. Even John Worth did not claim invention on the used A-frame and hung payload from the Rogallo-NASA-Ryan-inspired simple hang gliders and powered hang gliders. That JD did not appreciate or know about his mechanical parents at the beginning does not excuse him from failing to meet his parents and help on the motion to alter the certificates and diplomas to properly reflect the history of hang glider mechanical invention. Hobson did not claim invention in 1962 for a very very simple Rogallo Hang Glider for foot launching. Charles Richards knew the public domain arts and was not claiming invention in January 1962 when he project headed the cheap Rogallo-inspired wing for the hang glider made in that month. Using publicly owned arts in multiplicity is not a valid argument for claiming ownership of that public-domain art. Sorry, no mechanical invention for JD; and the FAI, etc. will do right to alter that fat "invention" claim that you started and pushed over a lazy-to-history hang gliding community. 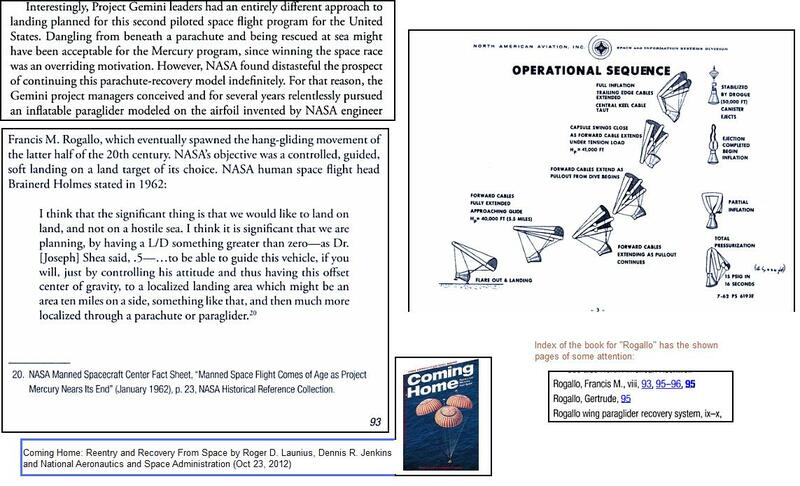 ARP's 1960 flex-wing hang glider was not by using Lee and Darrah as reference, nor NASA-Rogallo progress. Age 13 from scouting and kiting, he just built something that ended up also being an expression of public-domain arts; but for him it was a special adventure in kiting-gliding. He and all others and JD count for their local personal breakthroughs; and their each enthusiasm is something making good story usually; but local personal advances do not often rise to global mechanical invention. And certainly by facts and examples, JD did not globally mechanically invent what he personally tinkered up. And ARP did make his hang glider of 1960 fly, but of course, never to your satisfaction. But he was not active to satisfy you. How old were you in 1960, GH? http://www.youtube.com/watch?v=KwWi1X3h__0 Part I of a many-part series; see all parts. ARP flew his own Lilienthal way more than you flew your nil-Lilienthal; but such is a side issue. What was in public domain precludes invention; GH, please help the orgs undo what came from your thrust; thanks in advance. The earliest 1960 hang glider of ARP's design and make is not in the videos. That many boys and young men were not aware of the fullness of the arts in public domain does not justify any of them grabbing that public domain under false ownership at the level of global invention; such hurts history, society, creativity, and the merits of inventive parents. When such wrongful grab occurs in hang gliding, then such hurts the face and heart of the hang gliding community; let's hope that the hang gliding community will wake up to the wrongful grab. Will each hang gliding participant(HG) take the GH Test? I made some templates for parts of the DC-8 aircraft; fellow workers then made the parts by using the templates I made. Dang, I did not get credit for globally inventing the DC-8 aircraft! Actually, only some details in the sub-assemblies involved global invention; powered aircraft already were invented before the design of the DC-8. Imagine the chaos in the creative sector if the thousands of template makers all claimed that the whole party started and ended with their template. intellectual property (IP) theft and the making of templates for follow-on makes does not win historical global invention rights. Even IP-unawareness does not win the ownership of public-domain arts. GH, your sites yet neglect the robust backstory that would undermine the paramount headlining of "inventor" for JD; his true story without the hoaxing headline and untenable mechanical claims would be better than the story you push, I believe, as believable color and context could play without the having to doubt so deeply: "What is this GH guy doing to JD … having JD carry an awful weight that puts the whole run in suspicion?" Why the GH Test? Part answer: Hang gliding community, in part, wants their better face back. TOWLINE GLIDER: Takes off without assistance. Tows much easier than high aspect ratio gliders. Sinking speed depends on loading, which can be kept extremely light. and have hope that you may now release information about Jim's stay at the academy. We give a link to your academy. We in hang gliding seek to know Jim [sic, Jim's] life better, as he was at the cusp of the hang gliding renaissance that has starts in 1960, at least. Jim was perhaps unique in the way his hang glider project was shared to the world in Sport Aviation magazine and on an episode in 1962 of the Lawrence Welk Show. Whatever stories and information you may release to the public about James Hobson' stay with your academy would be appreciated. From very early on I worked on many very varied designs of aircraft in model form and full size. The Rogallo design was but one of them and it was based on a photo of the Ryan flexwing aircraft, seen in a book. I used parallel bars for the support and control system because that was how the earlier Lilienthal type was controlled and I was more comfortable with that. The film and photos made available are but a snap shot of one moment in time, not a complete history of any one of those machines. That history is known to me and you only know what I have told or shown you so your comments are just that and not the facts. As with Dickenson's experience, money for materials was tight in those days and that limited the range of material that could be used. Bamboo was both cheap and available and despite its tendency to split it makes for a very strong , light weight and resilient air frame. The sail material was also very cheap material and was not windproof. The lack of performance on all of the earliest machines was primarily due to this porosity. It was not until I was able to obtain a cheap supply of rip stop nylon that the performance improved markedly. Neither the Aerostructures aircraft or Dickenson's were foot launched so would not meet the FAI definition of a hang glider. They were both gliders designed for tow launch with the same basic configuration but with detail differences in their control linkage systems and water born equipment(floats or skis). The basic wing was interchangeable and Aerostructures used it's own wing on the Dickenson designed gliders they produced. Even Dickenson was unable to tell the difference and ,at first , tried to sue Aerostructors for breaching his 'Patent'. He was soon put straight as to who was first in producing such a wing and that a Provisional Patent is nothing but a record of intent to take out a Patent. It was never taken out and would, in my opinion, not been granted on mechanical originality or novelty. As an ornamental design it might have stood a chance. Regarding the Purcell machine I do not know if he applied for a patent or not but I suspect not. He and Rogallo had met and Rogallo had flown in the Purcell machine probably when it had wheels and on floats. The ancestry is plain to see with the Ryan flexwing being the source of the Purcell, Aerostructures and Dickenson machines and indeed mine!